First I have to thank everyone who made our 100th challenge and celebration Blog Hop such a great success. Thank you everyone who hopped along and entered a card. Congrats, ladies, please email me at rsdrees@verizon.net with your name and address just as it should appear on the mailing label and I will get your goodies right out to you. Our new challenge was chosen by our talented teamie, Lori. She wants us to make an ATC (Artist Trading Card) This is a 2.5" x 3.5" sized creation. 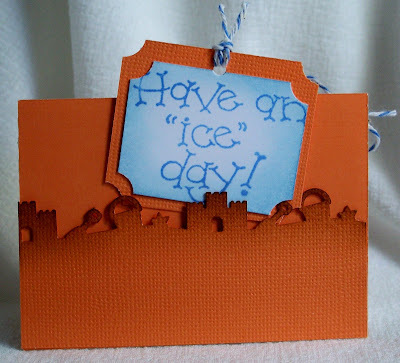 You can layer it on a card or just make an ATC. Remember you must use a House Mouse, Gruffie, or Happy Hoppper image. I used this adorable BRAIN FREEZE, HMUR-1051 Stamp. Colored with Copic Markers. Baker's twine from Pizzazz Aplenty. Sentiment done with a small alphabet stamp set. EK Success. Distressed the edges with Vintage Photo distress ink. Stamped sentiment onto white card stock then mounted on the orange card stock and used a ticket corner punch on all corners. Punched a hole in the top and tied a pull string with the baker's twine. Don't forget to check out the design teams inspiration at the House Mouse and Friends Monday Challenge Blog Site, along with the winners from our fabulous blog hop prizes. With July ending, we must now say goodbye to our awesome JULY GUEST DESIGNERS, Gill & Kat! Thank you both for your beautiful Mousie contributions! We've really enjoyed having you on board! Welcome Ladies! We are very happy to be working alongside you in August! Our sponsor this challenge is Simon Says Stamp. They have generously offered a $15 gift card for their online store. Thanks for stopping by today. Congratulations to all the winners of our 100th Challenge celebration, you made it so much fun! wow Sue the ice lolipop look so real. What is it about these little trading cards? I just love them, so tiny but somehow more special that a big card. yummie yummie this card is gorgeous!!! your colouring is fabulous its sooo real!!! What a fabulous card! This would be great for those of us enduring this heatwave right now. Love the colors and your coloring is top notch. cute stamp and card sue. Adorable... I like the idea of the pocket on the back, very clever. Great coloring as always, and jsut so cute. Thanks so much, Sue! 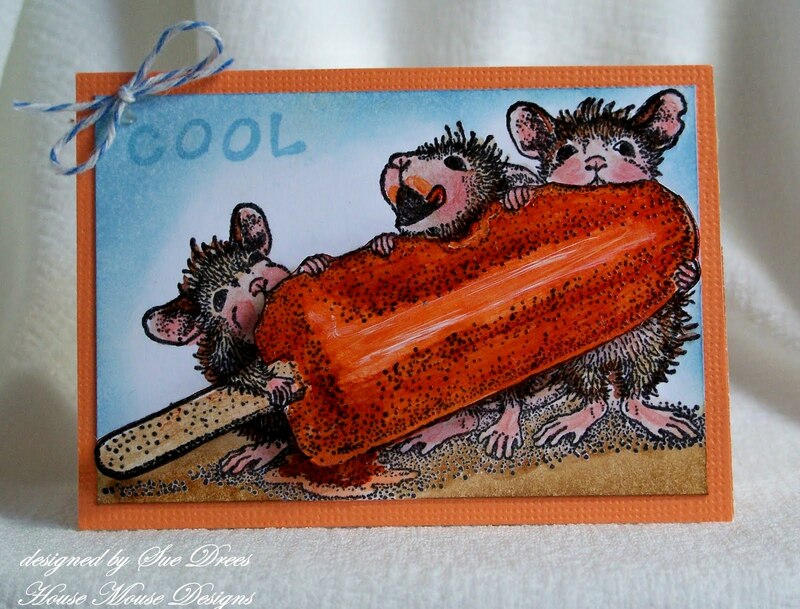 The new ATC challenge is such fun and I just love your popsicle version!